See the hidden wonders of the sunny, coastal city of Townsville in an environmentally-friendly way. Ride through the city’s beautiful parks and gardens on your own Segway – a two-wheeled, self-balancing electric vehicle. The guided tours run in small groups and take you through training before embarking on a two-hour journey, covering 8.5 kilometres of track. Suggested stays: Coral Coast Tourist Park and BIG4 Walkabout Palms, Townsville. Have you ever dreamed of living the life of a royal? You definitely can for a day with your very own chauffer on the Mornington Peninsula. Travel in style as you look at the peninsula’s magnificent green hills and sandy beaches from behind the glass windows of your very own Rolls-Royce Silver Shadow. While listening to the music of your choice, visit the peninsula’s finest galleries and dine at the most exquisite wineries. Some of the popular things you might like to do during your private tour includes a tour of a cheese factory, stopping at stunning lookout points along the coast, lunch at Arthurs Seat Maze or a visit to art and craft exhibitions. Silver Health Chauffer Services suggests it’s best to pick five tastings and venues a day, to ensure you aren’t too rushed. But if you simply want to sit back, relax and let someone else make the decisions, your chauffer is at your service! Suggested stays: Kangerong Holiday Park or Marina View Van Village. 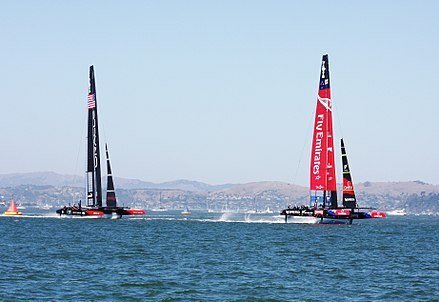 The America’s Cup is kicking off in San Francisco with the finals being held in September, but you can get involved with your Auckland car hire!